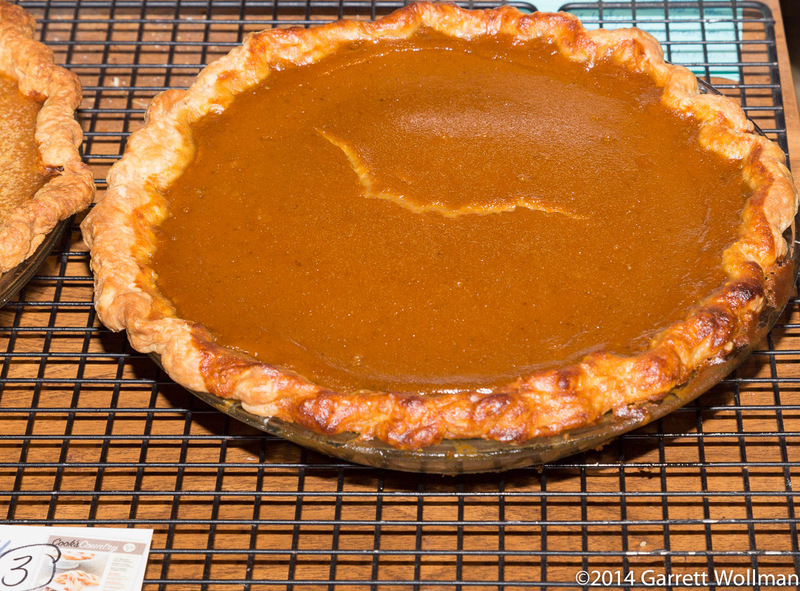 On Sunday, I baked five of the six pies. 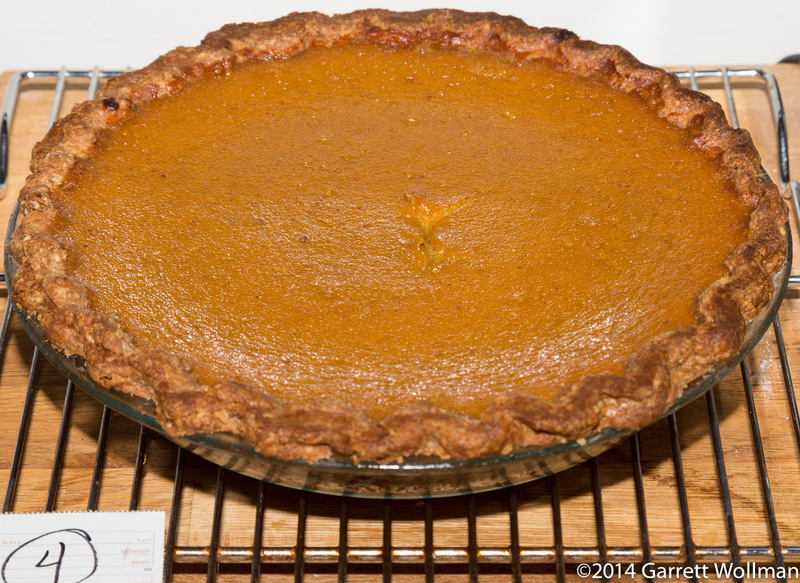 I ran into two issues that prevented me from baking pie #6 on Sunday: I ran out of both pumpkin and eggs. (This was perhaps because my shopping list was based on making four rather than six pies.) So today — Monday — I delivered the first five pies to the refrigerator at work (throwing away some clearly spoiled vegetables in the process of making room), then went grocery shopping so I could finish pie #6, Pecan Pumpkin Pie, about which more below. 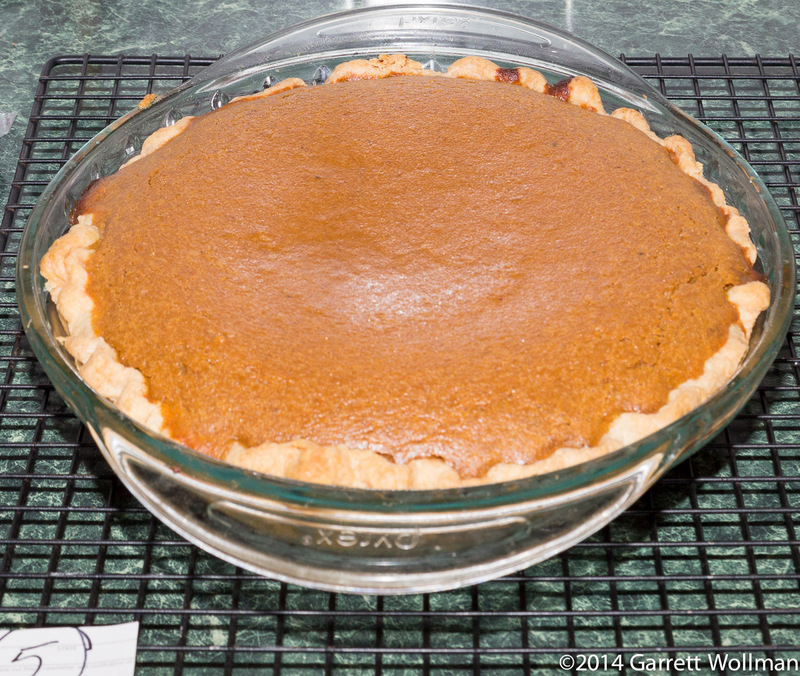 Although this pie is called “Honey Pumpkin Pie”, only a third of the sweetener is honey; I used McLure’s orange blossom honey. 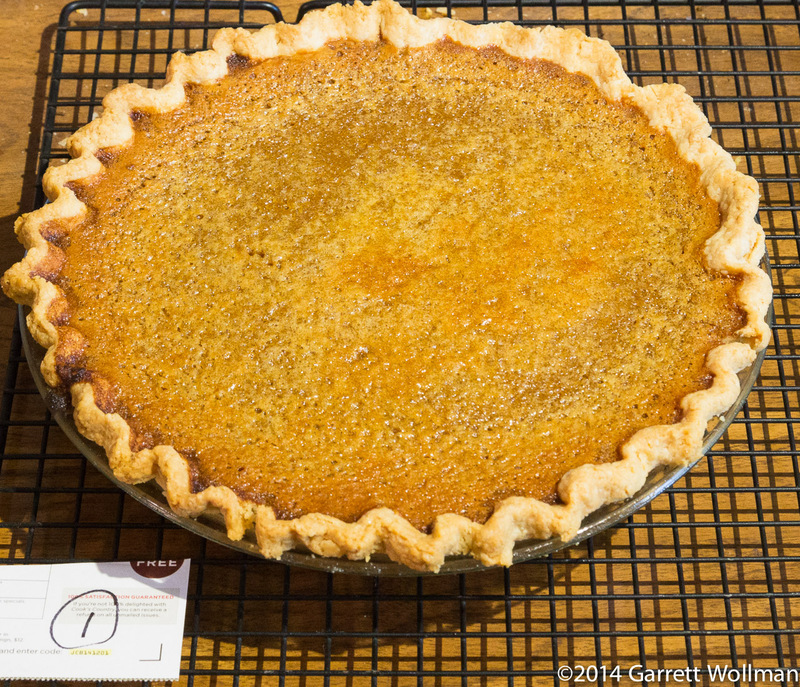 (The “Golden Pumpkin Pie”, below, from King Arthur Flour Whole Grain Baking is sweetened entirely with honey.) As I mentioned in part I, I did not use their pie crust, but instead used half of a double-crust recipe from Richard Sax’s Classic Home Desserts which Sax attributes to Nick Malgieri. As you can see from the crack in the center (which grew even more in cooling), I somewhat overcooked the custard. 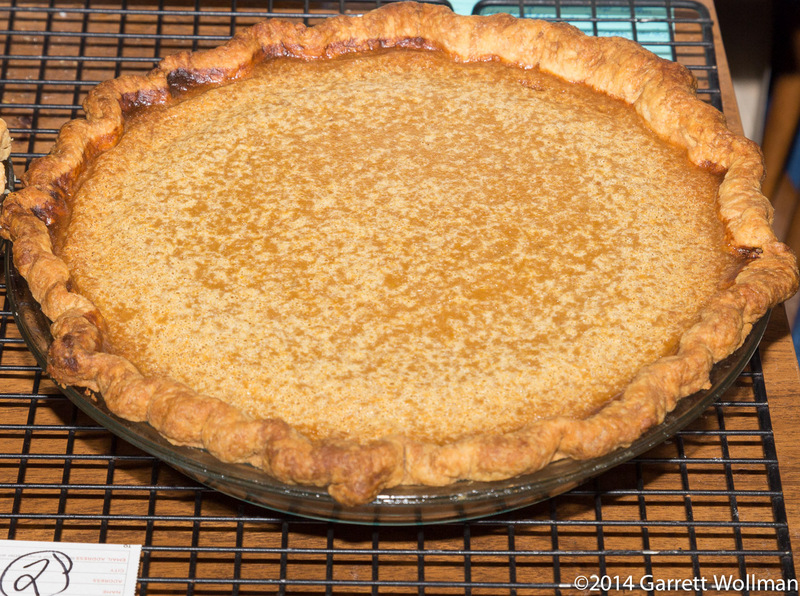 The brown butter in the title forms part of a butterscotch, which is the only sweetener for this pie, which has the most unusual ingredients list of the six pies, including both lemon and carrot juice. Beyond the honey, the other unusual ingredients in this custard are dark rum and a tablespoon of melted butter. The recipe called for half-and-half, but since I had plenty of milk and cream, I made my own rather than buying an additional dairy product I wouldn’t be able to use for anything else. While making this recipe, I ran out of my homemade pumpkin purée and had to substitute some canned pumpkin (actually Dickinson squash) to make up the difference. This recipe calls for rum as a fairly significant flavoring — three tablespoons — but only two eggs (all the other custards used three or four eggs), and brown sugar is the primary sweetener. 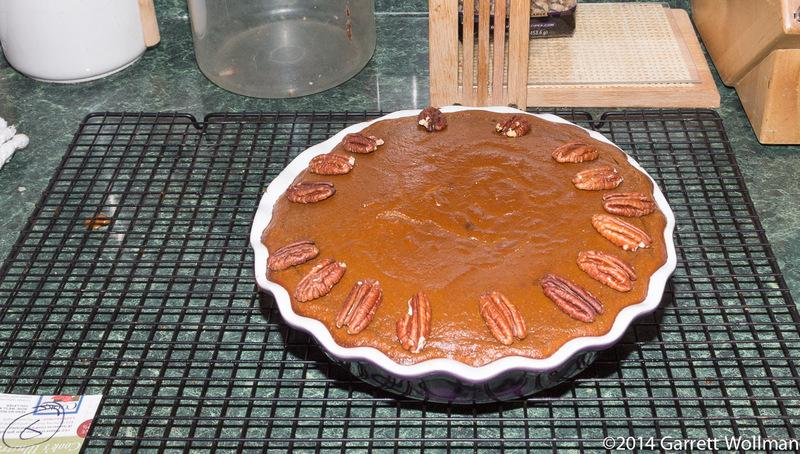 Before the pecan layer went into the oven, the crust was sitting on the rim of the dish. 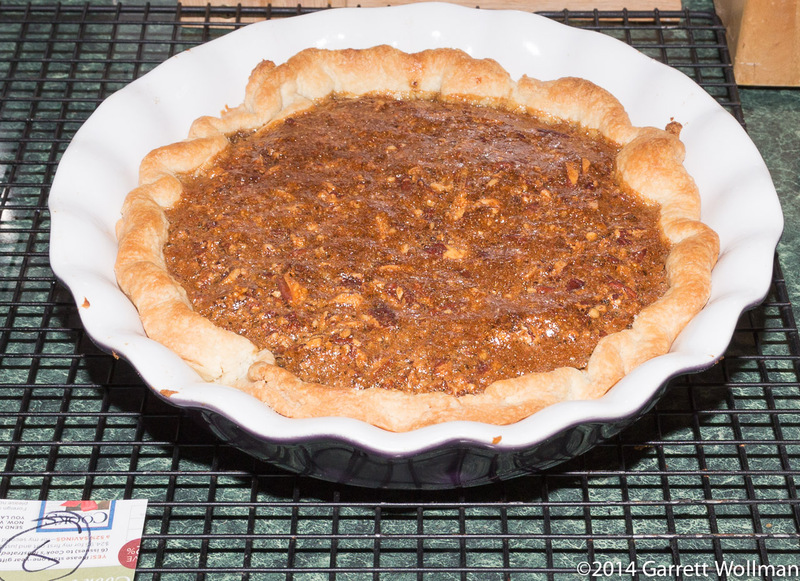 Now it’s barely above the surface of the pecan filling. Sorry folks, I’m not compiling nutrition information for all of these pie recipes! Any that I make primarily for myself, I’ll post again with more pictures, and give the nutrition results then. 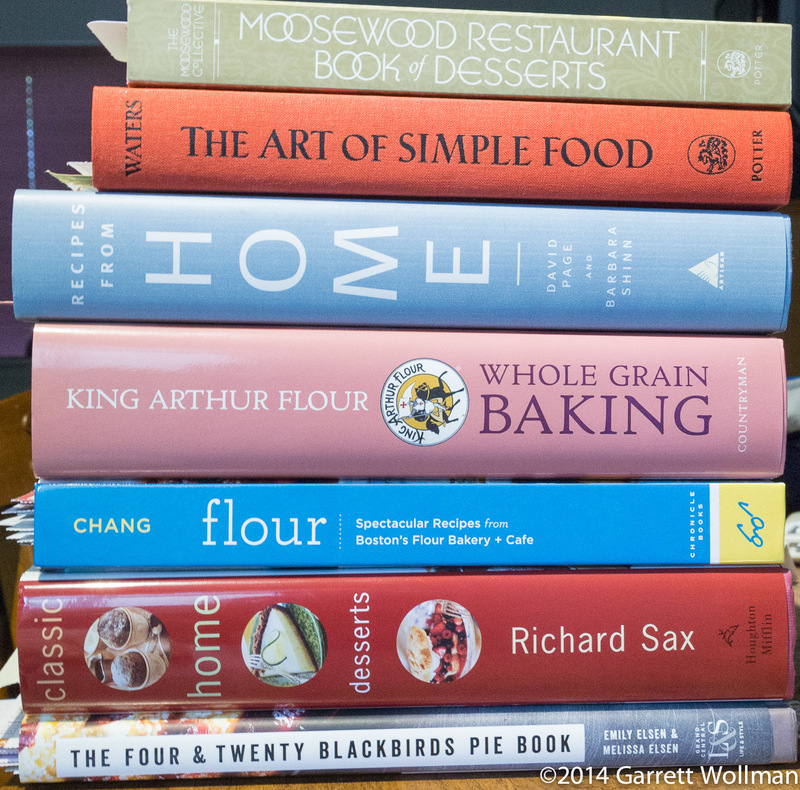 This entry was posted in Food and tagged Four & Twenty Blackbirds, Joanne Chang, King Arthur Flour, Moosewood, pie, pumpkin pie, Pumpkin Pie Fest, Richard Sax, work. Bookmark the permalink.